Yeah, I’ve been doing this acting thing for a long time. My first role was as the Big Billy Goat Gruff in a kindergarten version of The Three Billy Goats Gruff, and I remember taking that clip-clopping over the bridge stuff VERY seriously. I wish there were some photos of that debut, but since there aren’t, here are some other highlights from my early career. For more recent stuff, click on Acting/Production Photos above. 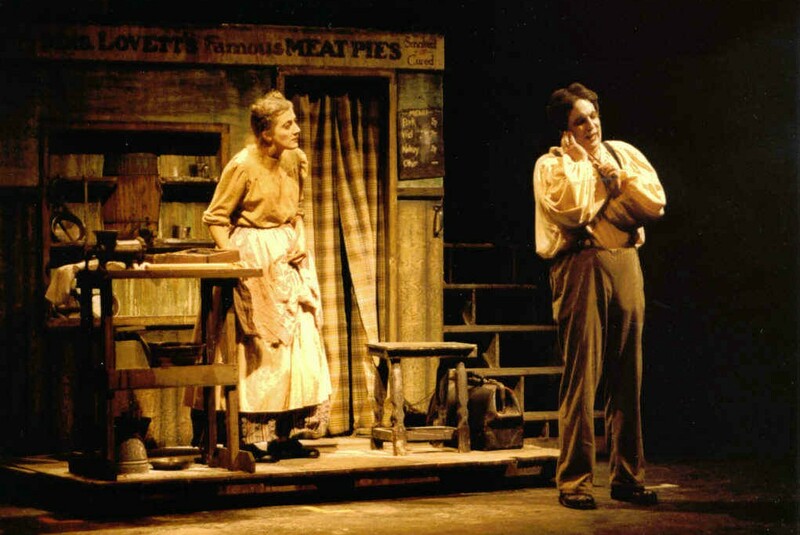 As Mrs. Lovett in The Arlington Players’ 1985 production of Sweeney Todd. I’ve done the role twice more since then, and it’s still one of my favorites. That’s Tim Tavcar as the Demon Barber of Fleet Street, singing the haunting “My Friends.” Community theatre or not, this was a fabulous production and a very happy experience. 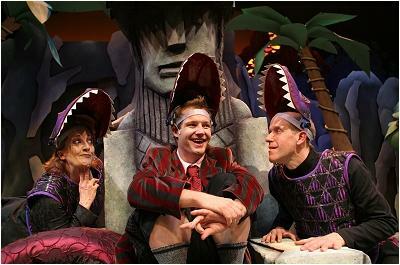 With Bryan Ashby in the long-running Mrs. Foggybottom and Friends revue at the Shoreham Hotel in Washington, DC. Again, I’m not sure exactly when this photo was taken – sometime in the late eighties or early nineties. I believe Bryan and I were playing Vice President and Mrs. Quayle in this number. With a few absences to do other gigs, I was with this show for nearly two and a half years. In Jacques Brel Is Alive and Well and Living in Paris at the Olney Theatre Center, 1995. I’m in the top row on the left. It was a highly conceptualized version of the show, which explains the variety in period and style of the costumes. 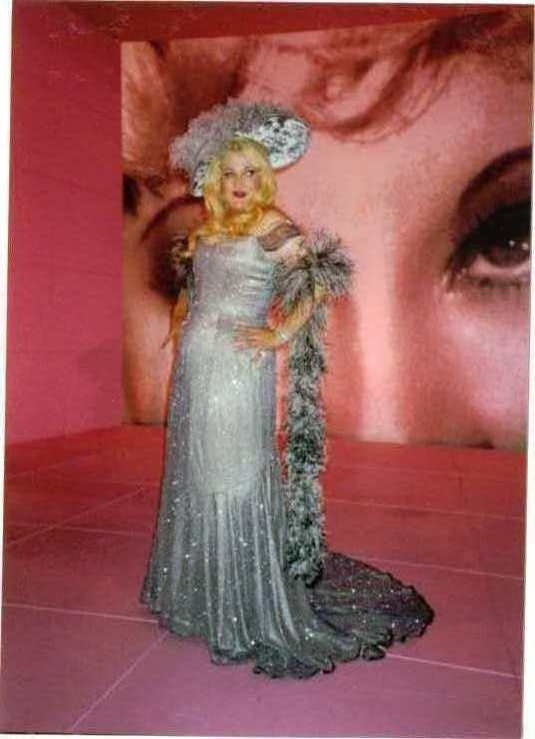 As Mae West in Dirty Blonde at San Francisco’s Theatre on the Square, summer of 2001. 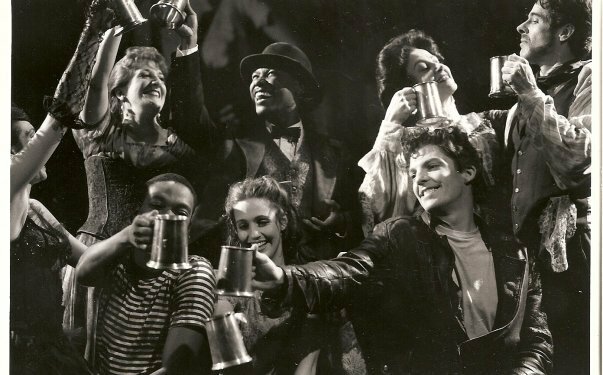 This was the West Coast premiere of the show, and the Broadway cast was transferred here for the run. I understudied Claudia Shear, (who also wrote the show), and took over the role for the final month of production. It was quite an experience and the costumes were amazing. There are no production photos of me in the show, but someone kindly took this on-set shot before the show closed. 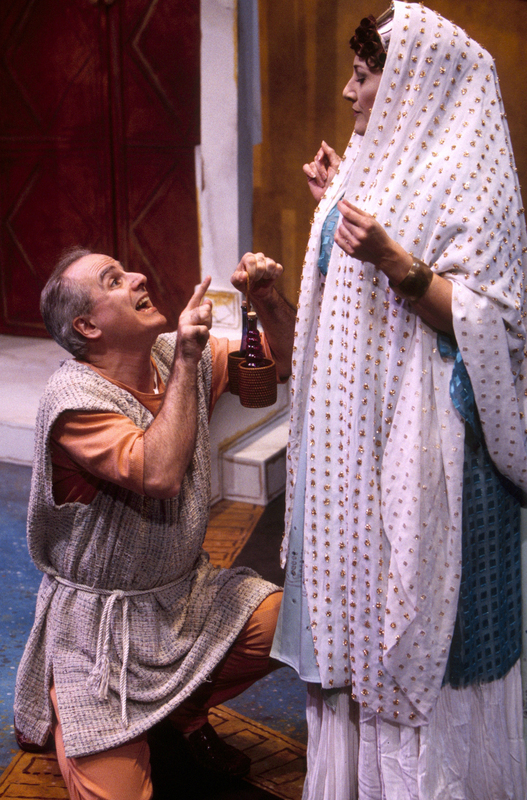 As Domina in A Funny Thing Happened on the Way to the Forum at Signature Theatre in 2003, with Buzz Mauro as Hysterium. I had so much offstage time in this show that I taught myself to knit (badly). But I did get to run around the stage with a banana in the second act.